A fresh sheet of Arches 140LB Cold Press watercolour paper stretched onto quarter inch plywood board with brown gummed tape. Photocopy of original design drawn with a sharpie. This can be traced onto the prepared watercolour paper with a hard 2h pencil and carbon transfer paper. 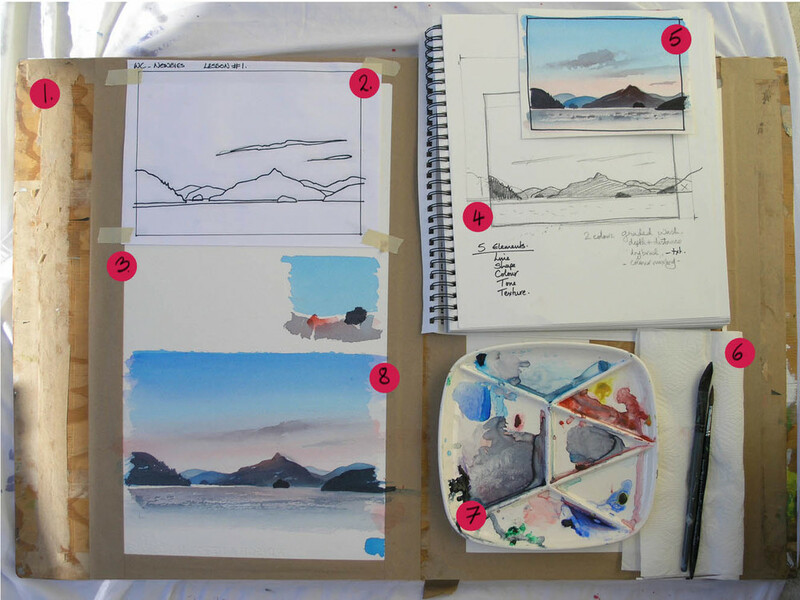 Leave a small strip of blank paper for testing marks, colour and tonal value. Sketchbook for keeping written and visual notes. Thumbnail colour sketch. If you figure out your colour palette on a small scale and it works visually, the chances are it will translate successfully on a larger scale. A wad of folded kitchen towel is useful for wiping excess water from your brush and drying the brush as you clean it in water. Palette can be anything from a white ceramic plate, a white butcher's tray or 2nd hand appie dishes like this one. Just so long as you have nice wide spaces to mix washes! Your small painting exercise 9"x13"
Painting exercise #1 - Anvil Island evening. 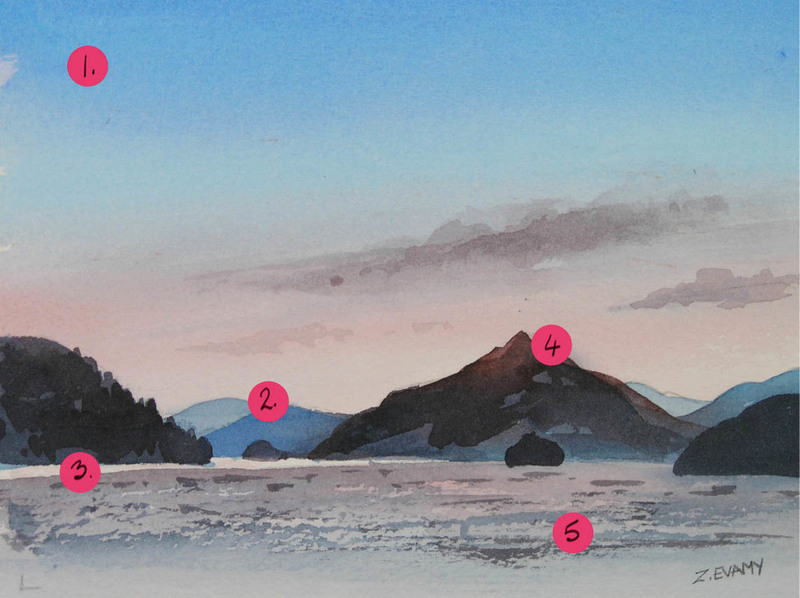 Even though this little painting looks simple, each of the 5 ELEMENTS of design play an important role and each has been carefully thought through and used with a purpose. The 5 ELEMENTS of Design are: Line, Shape, Colour, Tone and Texture. 1. Line can also mean the edges that define shapes. 2. 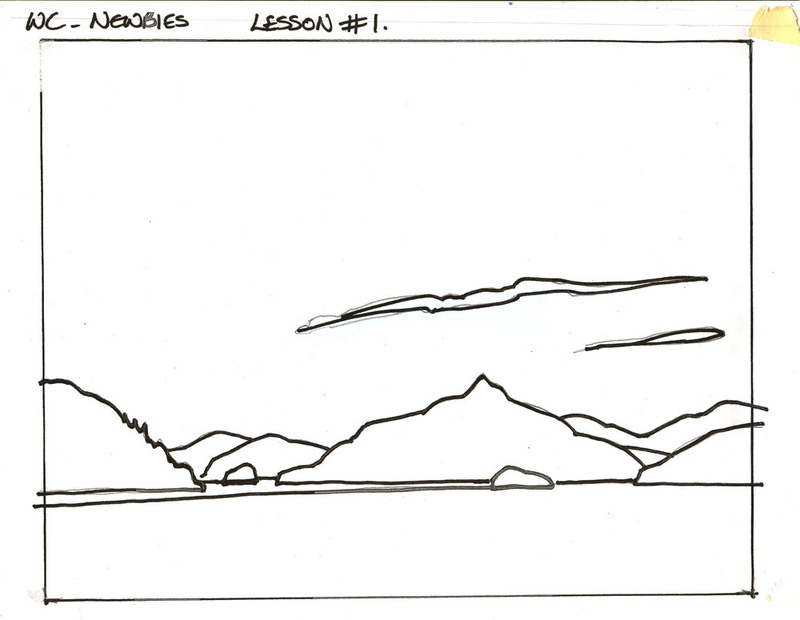 Notice the proportion of Shapes for sky, water and Islands. 3. Tonal values create contrast and the illusion of depth and distance. Our focal point might be where the darkest shapes meet the lightest. 4. Colour temperature is used here to reinforce the illusion of depth and distance. Cool colours (blues) tend to recede while warm colours (reds) tend to advance. 5. Texture is created here by lightly brushing with the side of a dry-ish brush to give a sparkle to the water. 5. Introducing a textural passage by using dry brush, creating a sparkle to the water. And here is the design if you feel like having a go at it yourself!